Ian Herbert, conservationist: "The next ship that leaves should have a pilot"
Maritime authorities in Australia are trying to stabilise a Chinese ship that ran aground near the Great Barrier Reef and began to leak oil. But Queensland officials say the Shen Neng 1 is badly damaged and the salvage operation could take weeks. Fears remain that it could break up, spilling hundreds of tonnes of oil. Environmentalists are furious about the grounding on Douglas Shoals, well outside the authorised shipping channel. The Chinese-registered ship is balanced precariously off the east coast of Great Keppel Island. A tug boat is at the scene to help prevent it from keeling over and to assist with any attempt at refloating the stricken vessel. Its Chinese crew have remained on board. Queensland State Premier Anna Bligh said the stabilisation could take "some weeks". "It's in such a delicate part of the reef and the ship is in such a badly damaged state, managing this process will require all the specialist expertise we can bring to bear." The BBC's Nick Bryant in Sydney says a 3km trail of oil has already escaped from a punctured fuel tank, which could pose a threat to coral and marine life on the Reef, one of Australia's main tourist attractions. An investigation has been launched to find out why the bulk carrier was 24km off its set course, well outside the authorised shipping corridor. Ms Bligh said the ship's owners could be fined up to A$1m ($920,000) for straying. "There are safe authorised shipping channels and that's where this ship should have been," she said. The 230-metre (754-ft) Shen Neng 1 is carrying 950 tonnes of oil and about 65,000 tonnes of coal. It was heading to China from the Queensland port of Gladstone. The Capricorn Conservation Council, a Queensland environmental group, said it feared the incident was a sign of things to come. 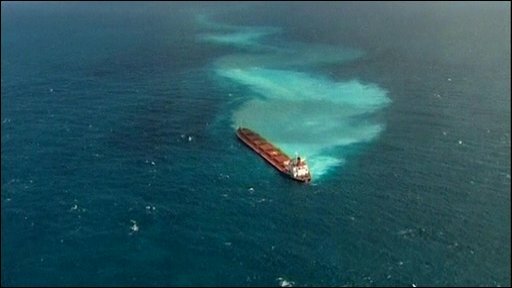 The organisation's vice-president, Ian Herbert, said if the ship broke up "it would would devastate the local ecosystems". "There are corals surrounding some of these islands that are very special," he added. The Great Barrier Reef is the world's largest reef system and extends for more than 2,500km. Celebrated as the world's largest living organism, it is already feared under threat from climate change.